"The brief with this pool was to design as big a pool as possible that was functional and fun," explains qualified landscape designer Cameron Leth. "We also had to deal with the different levels in an appropriate way and ensure the foundations of the house were safeguarded." Surrounded by granite pavers and timber decking, the 7m x 5.4m enclosed design includes a raised feature wall with two rain descents placed on a 45-degree angle. "This not only offers the soothing effects of running water but also keeps filtration equipment out of sight," Cameron adds. 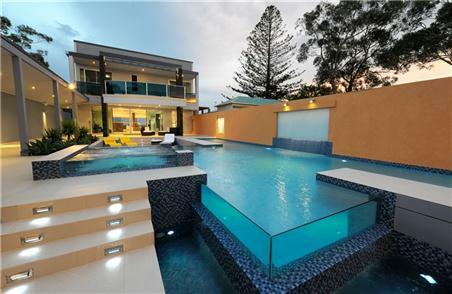 An integrated glass wall insert provides an eye-catching sight when viewed from the lounge room, which sits a level lower than the pool. 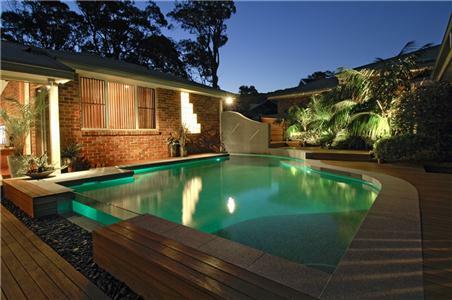 Traditional bullnose tiles that give the pool a modern edge further enhance the chic look. To create this visually arresting scene, qualified landscape designer Cameron Leth opted for a split-level design in the pool and a sunken seating area where people can gather around the courtyard. "Different levels allowed us to create to two negative edges for the fully automated pool," he said. "We then added the glass walls so people in the courtyard area could look actually into the pool - and it creates a wonderful glow at night." This visual effect is continued in the raised spa where two glass sidewalls enhance the 3D "butterfly effect" of the courtyard and its glowing prisms. There is also a lap lane and a swim bowl, plus swimout areas to cater for all active and passive recreation areas within the pool.